Photo of attendees of the 12th e-POP Science Team meeting. Back row: Dr. Donald Danskin, Dr. John MacDougall, Andrew White, Luc Dubé, Dr. Hing-Lan Lam, Dr. Bernie Shizgal, Dr. Donald Muldrew, Dr. Robert Rankin, Dr. Jean-Pierre St. Maurice. Middle row: Greg Enno, Dr. Jonathan Burchill, Andrew Howarth, Dr. John Ma, Dr. Paul Prikryl, Dr. Jim Laframboise, Dr. Ludmila Kagan, Dr. Martin Connors, Dr. P.T. Jayachandran, Dr. Robert Hum, Dr. Richard Giroux. Front row: Dr. Don Wallis, Dr. David Knudsen, Dr. Paul Bernhardt, Dr. Andrew Yau, Dr. Hajime Hayakawa, Dr. Richard Langley, Dr. Leroy Cogger, Dr. Gordon James. The e-POP Science Team is comprised of members from 11 Canadian and 3 international universities and research organizations. The Team is led by Dr. Andrew Yau as Mission Scientist and Project Leader, and by Dr. Gordon James as Deputy Mission Scientist. Several of the team members have led the development of the e-POP instruments: these include Drs. 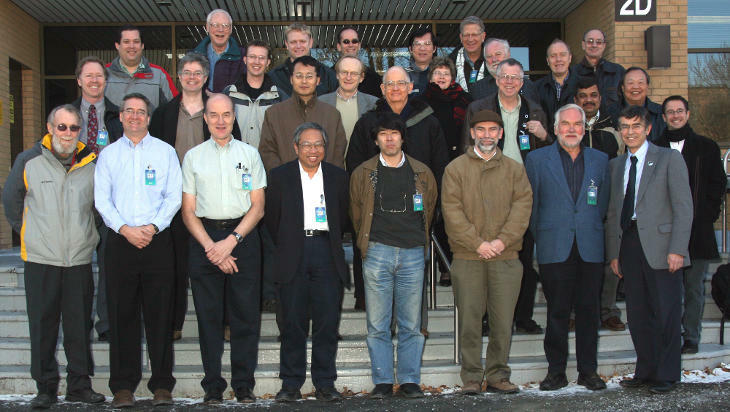 Peter Amerl, Paul Bernhardt, Leroy Cogger, Hajime Hayakawa, Gordon James, David Knudsen, Richard Langley, Sandy Murphree, Don Wallis, and Andrew Yau.